in St st with 1 strand each of MC and CC held tog. 31¼ (34¾, 38¾, 42, 46, 51)" circumference at underarm. Pullover shown measures 34¾"; modeled with 4¾" of positive ease. Much like the sparkling jewel of our solar system, the Saturn’s Rings Pullover seems to glow from within. 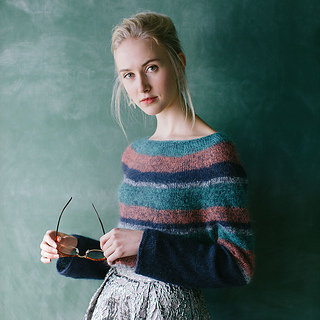 This top-down, seamless, circular-yoke sweater shows how easy it is to achieve stunning results with simple techniques and stripes. 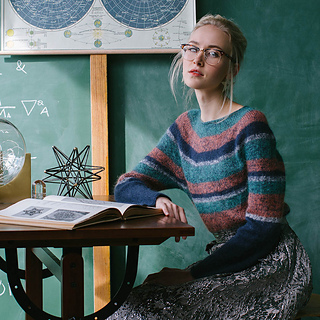 This sweater is worked by holding a strand of smooth lace yarn with a fuzzy mohair and silk yarn to create a soft, ethereal, and contemporary look sure to please your inner space nerd. Finished Size 31¼ (34¾, 38¾, 42, 46, 51)“ circumference at underarm. Pullover shown measures 34¾”; modeled with 4¾“ of positive ease. Yarn Rowan Fine Lace (80% baby alpaca, 20% merino wool; 437 yd / 1¾ oz): #940 sonata (dark blue; MC), 3 (3, 3, 4, 4, 4) balls. Rowan Kidsilk Haze (70% mohair, 30% silk; 230 yd / ⅞ oz): #660 Turkish plum (dark purple; A), 3 (4, 5, 5, 6, 6) balls; #666 Alhambra (teal; B), 1 (1, 1, 2, 2, 2) ball(s); #680 burnt caramel (orange; C), 1 (1, 2, 2, 2, 2) ball(s); #634 cream (D), 1 ball. Yarns distributed by Sirdar USA. Needles Size 6 (4 mm): 16” and 32” circular and set of double pointed. Adjust needle size if necessary to obtain the correct gauge. Gauge 24 sts and 33 rnds = 4” in St st with 1 strand each of MC and CC held tog. 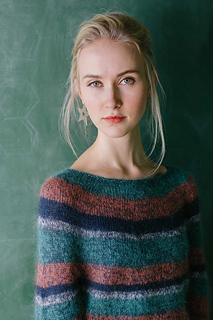 This pullover is worked in the round from the top down. Work with one strand each of main color yarn and a contrasting color yarn held together throughout. When working in Stripe Pattern, break contrasting color yarn at color changes.